One of the questions I get asked very frequently is ‘how I manage to cook with a very active child at home’. So I thought of writing this post. I am by no means a person who can give tips on this topic, but I am happy to share how I manage. If it helps anyone, I will be very happy. 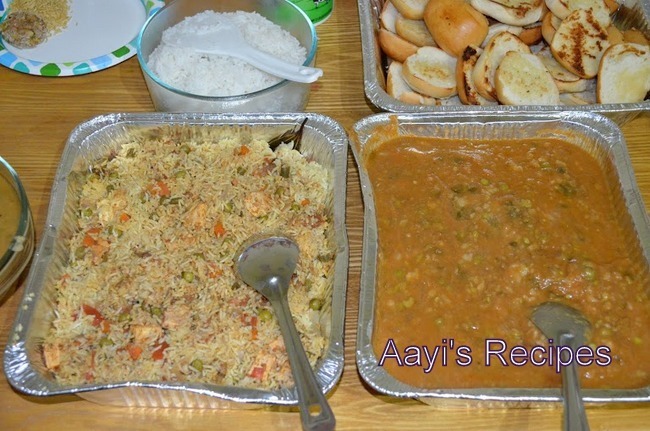 I grew up watching my aayi cooking for large functions at home. She would make everything from scratch, with some help from dad and my granddad. We had very frequent power cuts, so she had to grind big quantities of coconut on manual grinder to make traditional Konkani dishes. My brother and I were very clingy kids, so I don’t know how she managed it. I have never cooked for such large gatherings. But I have started cooking for smaller gatherings these days. One of my worry was the food won’t be enough for everyone – I am okay if I have left overs that my family can eat next day, but I don’t like if my guests go hungry. I am getting better at judging the amount now. I cook 3 meals almost everyday, but I like to eat out once a week. Our eating habits have changed after Ishaan was born – I have become more passionate about cooking from scratch with fresh ingredients, take for instance the pasta sauces, the pickles etc. I haven’t started making pastas from scratch yet, may be sometime soon!. After a recent India trip, I realized freezing food is very handy. When I have leftovers, I freeze them instead of having it the next day. This helps on those days when I come home late from Ishaan’s ‘play in the park’ for long hours or after his swimming class. I have realized that, when a child is at home fulltime, they need full attention, most of the time. When Ishaan went to daycare, I had more time on hand, I didn’t feel so guilty about leaving him to play alone. Now he wants me all the time – to play with him, to be with him. So it becomes a little hard to spend lot of time in kitchen. But I try to have some friends home once in a while, Ishaan LOVES when we have company. Here are some things that I follow when I have guests, all are simple ones, probably you all are already aware of most. – Involve child in whatever I am making. I always get a stinky eye from parents when I say this!. I started involving Ishaan in cooking from a very young age. I know involving him means anything that takes 5mins would now take 30mins!. But it is a fun activity for him and he is learning a skill. I let him add chocolate chips if I am making a choc-chip cake, let him measure out sugar and so forth. I mix the chapati dough and have him try and mix it by himself. Two things come out of it, one, he has fun and second, the chapatis come out extra soft with all that mixing and punching. I cut small pieces and give them to him to make small dough balls. If I make making something with boiled eggs, he peels the eggs. The best part of all this is, he gets very excited about eating what he has helped me make, a win-win situation. If he is not helping, he sits on the counter and looks at my work. I started this after he turned around 2 and I never leave his side when he is on the counter. – Take enough breaks. Instead of making everything at a stretch, I stay in kitchen for sometime, then I take a break and play with him for sometime. That way he is engaged in some play when I finish work. I use oven wherever I can. I have started making veggie patties for many get togethers, instead of shallow frying, I bake them. I serve them with simple sweet-sour chutney and sev. – Plan ahead, it is not fun to do shopping with a child running around!. I am not good at planning ahead, there are days when I don’t know what I will be making till I step into the kitchen. I open the fridge, find out what I have and come up with a menu. This works perfectly for me, but when I have guests, this does not work very well. So I have started planning ahead. Instead of thinking the menu in myahead (which I used to do before), I write down atleast some of the main dishes I am going to make. Then I write down what I need to buy to make those. I still throw in some last minute dishes with what I have on hand, but atleast the main dishes get prepared without extra trips to grocery store!. – Try to pick easy dishes that don’t require too much time to cook. I try to avoid making things like chapatis that take a long time. I make them if I have 4-5 people, more than that, I avoid making them. I make idlis because they are very easy. – Multitask. Like when potatoes or daal is cooking on the stove, start chopping. I do these in right order so that I am not standing near the stove waiting when something is getting done. – Cook as much as possible when child is sleeping. Ishaan used to sleep by 8 when he was younger. So after he slept, I would cook some dishes. I do not like staying up late cooking, so I am out of kitchen by 9-9:30. I wake up atleast one hour before he wakes up. I get so much done. I use this time very effectively. – Make the preparations ahead. Although I chop the veggies when I cook every day, I like to chop veggies ahead when I have company. (I have tried chopping veggies and saving them on weekends for weekday dinners, but it never works for me, because I do not want to spend whole weekend standing in kitchen). – Use dishwasher. I can load a dishwasher with a sink full of utensils in less than 5 mins, but if I am washing them by hand, it takes min 20mins. So even if I have to start the dishwasher multiple times a day, I like to use it. For me, it saves time. Only thing I have to be careful is to remove all the food particles from utensils. I have one nonstick tava that I use for dosas and 2 cast iron pans – one grill pan and another pan that I use for everything else, that needs hand washing. Everything else goes in dishwasher. The best part is, the little one loves to unload all the dishes after it is done!. The biggest lesson I have learnt is – No matter how much you like to entertain people, it is good to take it cool and relax when you have a child below 2 years of age. After that age, it gets a bit easier. If you still want to have friends over at home, go for potluck. Personally, I would like to prepare everything on my own, but potluck makes it easier on you. You can make a few dishes and others can get a few, that way you don’t have to stand in kitchen for a long time. – The previous day morning, marinated the chicken. Chicken gravies always taste better theÂ Â next day. So I prepared the gravy the previous day evening. – Roasted vermicelli and rava(sooji) well in advance while I was making dinner few days before. Soaked them in yogurt the previous day and added all other ingredients (except soda). – In a pressure cooker, kept the potatoes and veggies needed for pattis in one cooker insert and dal in the other. – While they are cooking in pressure cooker, got everything else ready for sambar. I like to cook the vegetables on stove top with tamarind, salt and asafoetida (I used to cook them in pressure cooker before, but now I like stove top better). – Chopped onion first, while they were cooking, chopped potatoes. Added potatoes and capsicum to onions and prepared the potato-capsicum dish. – Once cooker is cooled, prepared the sambar, while it was cooking, prepared the patties mix, shaped into pattis and kept them aside. – Started off the jeera rice on stove top and then moved it to rice cooker. I use a steel vessel in my rice cooker – i.e, I use it just like a pressure cooker. This helps in easy cleaning up, the steel vessel goes into dish washer after rice is done. – While idlis were steaming, prepared chapatis. – Just abut 20mins before my guests arrived, kept the patties in oven for baking. So they came our hot and crispy when they arrived. – Shaped the patties and refrigerated them. Since I had to make lot of patties, I didn’t want to keep that work for day of get together. – Just like the previous party, I roasted the vermicelli and sooji well in advance. Then mixed all other ingredients on previous day. – Prepared pav bhaji. I used tomato paste here instead of using fresh tomatoes to save time. – While pav bhaji was cooking, kept the dal in pressure cooker. (I could have done this the previous day, but my cooker can fit only two inserts and I had to cook a lot of veggies, so there was no space). – Prepared paneer biryani on stove top and white rice in rice cooker. – Prepared sambar, while it was cooking, grilled pineapple. – Cooked corn in microwave while grilling the pineapple. Prepared the salad and refrigerated. 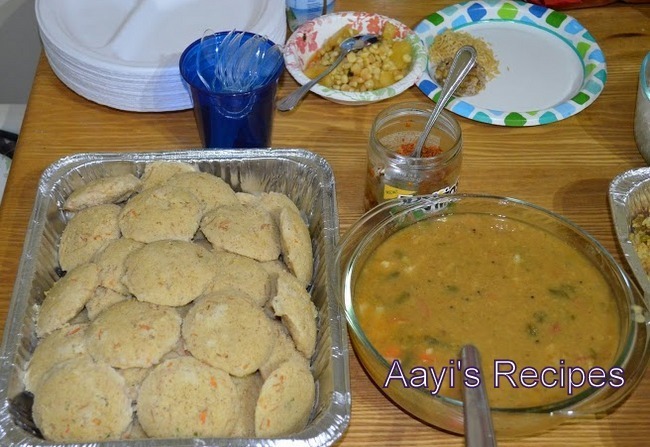 – Steamed idlis and in the oven kept the patties for baking. PS: I don’t have enough serving bowls/plates/cutlery to serve food to so many people. So I use plastic/aluminum foil use and throw trays/spoons/forks and paper plates. I absolutely hate the wastage, so I am hoping to find a better solution in future. What a detailed and informative post, Shilpa! I understand what you mean about wastage by using disposable dishes etc, however, if it is any comparison, I would like to point out, when we use the dishwasher, we do end up using a lot of water, so looking at it from a different angle…… less guilt? Plus it is not an everyday matter. Pallavi, from what I have read, dishwasher uses much less water than washing by hand. We first realized this when we lived in our previous apartment. I started washing by hand and we got a notice from the office saying we were using a lot of water (well, it may not be my fault entirely, but it added to other things that were going on in that building). Well, I still have to read more to find out which one is more efficient, but it is the time factor that makes me lean towards dishwasher. (Ohh and I am lazy and absolutely hate washing cloths or utensils 🙁 ). It is true that dishwasher uses less water abt 1.9 lt to wash full sink vessels..we use may be 10 or 15 times more water than dishwasher .. True that diswasher used less water then hand washing. Agree, biryani is really easy dish for parties. I sometimes go with just simple pulavs, which don’t require too much work. nice post! i like the part about involving the toddler. i need to do it more. but i do not have a lot of counter space and i am always scared about her touching something hot or sharp. but i need to be more mindful of where i can involve her more in the kitchen. other tips are useful too! and menus and breakdown are also very helpful to others planning similar parties. Ohh you have to be really careful if you make them sit on counter. Luckily, I have a big counter in this apartment. I pretty much move everything before making him sit there. Thanks Siri. So nice to see you here. She can help with dishwasher now :). Agree. I am learning to plan ahead these days. Very interesting and informative post! I have 2 kids ( 3 yo and almost 2 yo) and my older one is beginning to ‘help’ me a bit these days. Unfortunately, my kitchen is tiiiiiiny and most of my food prep gets done in the hall in front of the TV. I particularly avoid baking/ cooking with eggs or raw chicken while the kids are underfoot since they follow the murphy’s law principles of grabbing the most avoidable stuff even if I dangle cookies or candy to lure them away. Agree, chicken and raw eggs are not somethings that toddlers can handle. I give Ishaan what I feel is safe for him (safe even when he puts them in his mouth). I sometimes make him sit on the dinner table when he wants to help me. Such a well-written and detailed tips! I am a very regular visitor to your site and every recipe I tried from your blog are a hit at my home. So thanks again! I have a request: can you please share veggie patties recipe! I would like to try making it. Great write-up! Loved all the details. I’d like to hear more about making rice in a steel vessel in the rice cooker. I hate cleaning up the rice cooker and this seems to be like a great option. Do you mind sharing how you go about it? Like do you add water inside the cooker or just in the steel vessel? Does the rice stick a bit on the bottom? I add about 2 and 1/2 cups of water in the rice cooker and then keep the steel vessel/cooker insert. It does not stick (just like pressure cooker). Just remember, once you start keeping the vessel in it, the rice cooker may get some scratches! you make kitchen work as easy as a very well researched and time tested project. hats off to you. you have been very systematic. Nice post Shilpa. I’m a regular visitor to your site. I totally agree with involving the kids in our cooking. Both my kids LOVE to help me. One of our weekend specials is to bake a cake together. My 2.5 yr old also loves to help me bake. It’s become a routine feature now to bake every weekend and I so love it. Recipe for the veg patties would be great. What an informative piece of idea and you have written it very beautifully.i use all theses tips for last five years.I have two kids and the younger is just 14months.I used to be like donot know what to cook untill evening.But I learned to organise things after having my son.I would like to share another piece of advice to all mums here that online grocery shopping if you struggle with active kids who doesn’t like mum shopping,or struggling with work and time.It works best for me.It may again depends on your situation. Again thank you very much for your effort to share those with us and thank you to you to finding out time for all your readers even in the busy schedule.ANyway I am here today to search for paneer tikka masala.I tried that few times in the past and always came out well.have a nice day. Hi Shilpa, I saw a pic of your mantap that you posted on fb and was wondering if you could tell me it’s dimensions. I liked it and might go to that store and order a mantap for myself too. Thanks in advance. NPrabhu, It is 2ft width, 2 and 1/2 ft height and 1 ft in depth. They have different sizes to choose from. It can be dismantled into three big pieces, so it is easy to carry.